Having shown a darker side of natural Florida in my last post, here is an example of the extraordinary beauty that exists in the state. Named by writer, journalist and environmentalist Marjorie Stoneman Douglas, Florida’s River of Grass flows through the heart of South Florida providing vast landscapes and a home to numerous species of wildlife. 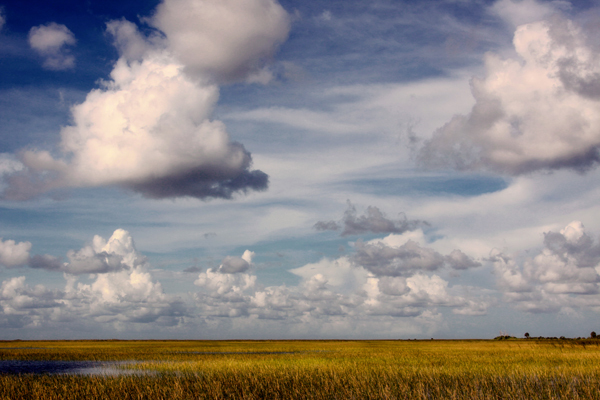 With a topography that is so flat, a good vantage point to shoot can be achieved from a manmade rise or observation tower (although Big Cypress’s Clyde Butcher www.clydebutcher.com creates B & W images with his 8 x 10 camera while standing waist deep in the swamp). I have tried that, but I find myself paying too much attention to what might be coming towards me, rather than what is in front of me. While alligators periodically swam by, I shot this scene from the safety of an air boat that was briefly standing still after a noisy (ear plugs mandatory) ride, hovering above, and across the sawgrass.